Appearance: Color is a nice clear ruby/brown with a tan creamy head. The head didn’t last a very long time but left nice lacing. Smell: Clean smell with some nuttiness and sweetness. I feel the smell is very unique to Newcastle. Something to do with their special recipe. Initial Taste: Starts off with sweet caramel followed by yeast and corn. The flavor is very mild with mild hop spices and for a darker beer like this there is very little malt flavor. Thoughts: Newcastle seems to be a like/hate beer. There are many reviews on both sides of that coin. I happen to like Newcastle. It’s one the biggest commercial beers imported into the US (105 million pints a year). In order for a beer to be that popular it has a very big following. The flavors truly are unique to Newcastle. There are vegetables, corn, caramels, hops…like I said…very unique. This beer also makes for a very good session beer. While there are unique flavors in this beer everything is very muted making for a easy drink and little aftertaste. 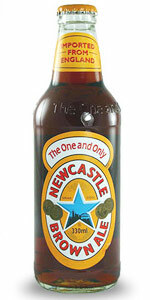 If you have never tried a Newcastle I highly suggest picking some up. If you don’t like I’m sure you can find a friend who would be willing to take it off your hands…and if you do like it…score!